Nail Puller, 10 inch. Polished ends reducing material damage. Claw with small striking surface allows for precision penetration and ease to be driven under embedded or headless nails. Nail slot at both ends to ease pulling nails. Made of forged and tempered steel. Ideal for precision nail pulling and prying. Nail Puller, 8 inch. Polished ends reducing material damage. Claw with small striking surface allows for precision penetration and ease to be driven under embedded or headless nails. Nail slot at both ends to ease pulling nails. Made of forged and tempered steel. Ideal for precision nail pulling and prying. 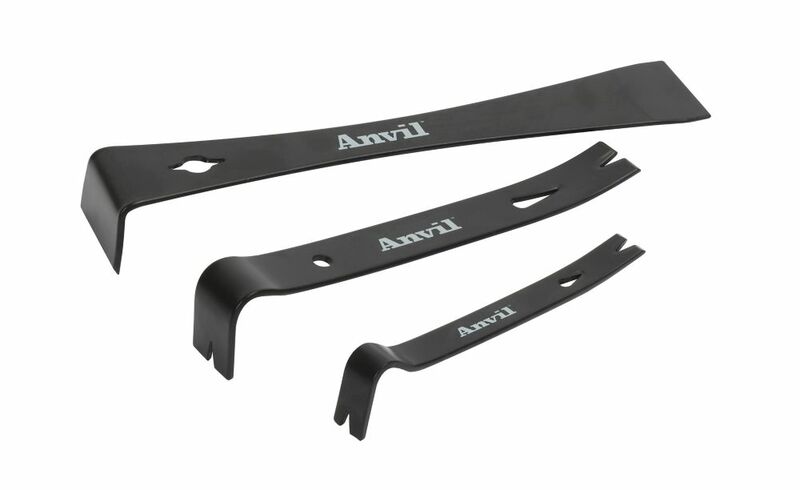 Prybar Set (3-Piece) The ANVIL 3-Piece Pry Bar Set is well suited to a wide variety of prying and scraping applications. This bar kit includes three popular small bar styles that are perfect for do-it-yourselfers and pros alike. Designed in a compact size that fits just about anywhere, these bars work great for prying trim and moulding, scraping excess paint, opening paint cans and pulling nails.